Los Angeles CA Builder, Neal Franson. Neal Franson has had over twenty five years of experience as a general and landscape contractor with a Bachelor of Science degree in Landscape Architecture. 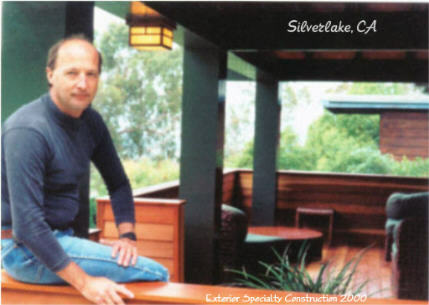 Specializing in exterior construction of wooden and composite decks, hillside decks, patio covers, heavy timber pergolas, pavilions, various patio structures and exquisite wood gates and fences, he has serviced the Southern California area since 1983. The personal knowledge and creativity as an artisan contractor is brought out in each project, as can be seen in the pictures and articles offered in this website. "People choose us because I build things to last, and if they want a truly handcrafted project. There are things I do to make projects last that nobody else does, and that is what makes us unique.". Exterior construction is really its own specialty. Contractors not versed in it tend to build first and paint last, but this is backwards. It leaves joints exposed to moisture which can cause dry rot. We do many things to make your project last, which can be found in our various news letters. Each project is a custom product created on a personal basis to fit your needs. We do our best to keep our communication open and straight forward. Once we start a project, we are working on it daily until it is done. We have innovated Solar Patio Covers into an integrated design that is practical and aesthetic. We also work with some noteworthy Designers and Landscape Architects in the industry and are looking for long term working relations with other established Designers, Landscape Architects, Architects, as well as related Contractors with whom we can work with and exchange references and link to their web sites. Contact Us! What can be envisioned when one has the knowledge and the drive can become transformed into reality with dazzling consequences!